So, we've finally decided on a pushchair! 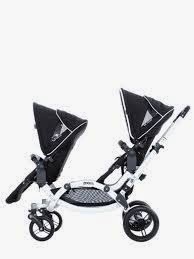 I've previously mentioned the Obaby Zoom, Cosatto Supa Dupa Twin, Bugaboo Donkey Twin and Mountain Buggy Duet. Some were recommended in the comments or on Twitter and I am so grateful for all the advice we've received from those of you more experienced with prams than we obviously are! Initially we were really interested in the tandem Obaby Zoom. We loved the idea of having the twins able to face each other or face either me or the world without one being stuck right in behind or below the other. We liked that it would be thinner as they're not side by side so might be easier to get through doors and along pavements. We still haven't managed to see it in real life however as nowhere nearby has it in stock. I have heard from Vivienne, who has seen it, that due to it's extra length it is quite a beast and tricky to manoeuvre and get through doors despite being thinner. It's also quite heavy at 17.9kg so lifting into the car boot might be hard. It might actually be more tricky to steer and tip up onto kerbs as well as fitting onto public transport, etc too so we've now ruled this one out. Total price = £788.96 (including 2 carrycots and 2 car seat adaptors) from Mothercare. We really don't like the other tandem designs, some of them make no sense to us like this iCandy Peach (here with seats) or this Stokke or Oyster where you can hardly access the lower baby and they just have a view of the bottom of the other seat/carrycot. 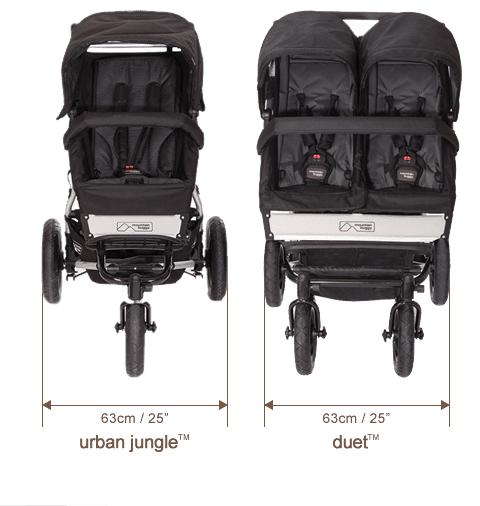 Some of them like the Oyster max double and the Baby Jogger City Select twin even have the option to have seats facing when the twins are older but seeing them in the shops it looks like one toddler could literally be kicking the other in the face! Total price = £288 from Kiddicare (no bits to add makes this the cheapest option). The next option we were seriously considering was the Mountain Buggy Duet. Pros for this option includes the price (they even have an offer currently on a pre-release new model at half price in return for feedback although only in the red colour), the thinner width and it converts to a full travel system with car seats and carrycots. It's also a bit lighter and folds smaller than some other options. The things that put us off include the metal foot rest which I would imagine getting very hot in summer and burning toddler legs! Its narrowness also means there is much less space for toddlers when they get bigger. It's also the most boring option as it comes only in red or black. Red is definitely not for me as although I am not a fan of baby pink, I will be making the most of dressing the babies in green until they can argue ;) so they would clash (Christmas stylee) in a red pram. We also didn't like the feel of the handle, I could easily imagine getting sore hands and possibly even blisters due to the rubber grip with ridges, not comfortable at all. To recline the seats you need to adjust 2 strap toggles for each seat which was all just a bit fiddly, especially when bending under to get from flat to upright again. It also looked and felt like a cheap option, the edges around the straps were raw so you could see the foam padding and I can imagine it getting quite tatty after a lot of use, you can also feel the hard plastic poking through if the cover moves a little bit. The ultimate reason we ruled it out though was that when folded down, it doesn't lock. Every time I tried to pick it up to test the weight (15.5kg) and ease of transferring into a car boot, it kept unfolding making it very awkward to lift. The shop assistants were confused about why it didn't lock and we all checked the manual and concluded that it just doesn't lock. Silly. Total price = £699 (including 2 car seat adaptors and 2 carrycots) from John Lewis. Obviously the one I really liked in the end happens to be the most expensive option, typical! (I was googling high chairs the other day and clicking on my favourite before knowing any of the prices - ridiculously expensive, how do I do it?!) Gaynor recommended the Bugaboo Donkey and when we first saw it at the Glasgow Pram Centre, we weren't convinced as it seemed so big and bulky but it was the first twin pram we saw in real life. Anyway, after comparing it side by side with the Mountain Buggy in John Lewis and taking them both for a spin, we decided this one felt lovely to 'drive', had a comfy handle and was easy to fold, locking automatically and easy to unlock and rebuild. It wasn't actually that much wider than the Mountain Buggy and feels really good quality. This one also makes me happy as I can choose the colour(s). There are SO many choices for single buggies out there and a few green ones (which I would obviously love) but none of the twin ones seem to come in green. The bugaboo has a petrol blue fabric which is more like teal if you ask me and would be my preferred option. 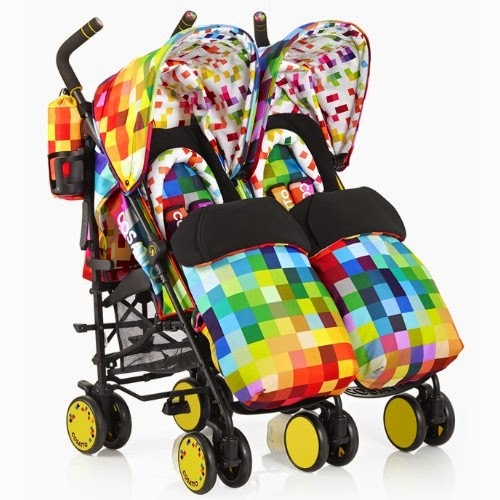 I've seen so many mums with stylish buggies and would like to have one that I actually like to look at since I'll be pushing it around a lot (and most likely much less concerned with my own personal style when caring for 2 babies)! 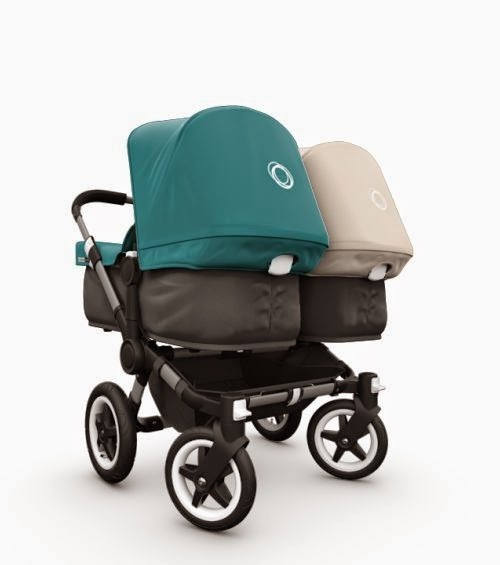 I like the idea of having 2 colours and the combination of teal and off white looked pretty good on the Bugaboo website when I put my choices in. Total Price = £1270 including car seat adaptors, 2 carrycots and 2 seats from John Lewis. As you can see, this one is about £400-500 more expensive than the other travel systems we've considered. In the end though, we did agree that it was our favourite and should last us a few years. As we're also moving house and I am not earning as much at the moment (work is very quiet unfortunately!) and having to finish work earlier than I would have planned, we're really trying to watch spending. As a compromise we've decided to try to buy a second hand Bugaboo but I am allowed to personalise it with the colours I want if the second hand one isn't petrol blue. Second hand ones seem to be about £700-800 which would save us the difference between this and the cheaper options. I was a bit worried about a buggie that's been pre-puked and pooped on by other babies but we would obviously examine it prior to purchasing and I think most parts are removable to clean (as you don't want your own babies lying in their own pukey, poopy pram anyway). We've actually seen an off-white twin one with all the bits we need for £750 not too far away so we're going to see it this week (although we don't want to buy bulky stuff before we move - we're not going to pass up a bargain!). We're thinking anyone who's bought an off-white pram must be pretty clean!? It seems that they have a pretty reasonable resale value as well so if/when we decide to switch to a different style of buggie, we can also sell it on again at a decent price. So hopefully in a few months, you'll see me trudging around Sussex with this beautiful teal and off white Bugaboo number with our twins! WE were ready to buy our stroller at full price (well, almost, as I had already located a good discount) when we looked into 2nd hand. It is like new, in pretty good condition, I loved the color (a different, royal blue, as opposed to black, brown, gray or red), and all the parts are washable. And extra bits are not expensive at all (Eg. to replace a tire it would be 10 EUR). I am not sure if it exists for twins but I absolutely adore our Maxi Cosi Mura Plus 4. It is actually quite similar to the Bugaboo and when we tried at the shop ours was easier to fold.